As the sun starts to set behind the mountains, I remember that I left my Dramamine in the suitcase. There is no cellphone signal on these winding roads taking me down and around sharp curves. As such, I’m not able to search my iPhone for a Walgreens. And come to think of it, I haven’t really seen any kind of store in the last twenty minutes. Did I mention that I’m in America? This road I’m navigating (and stomaching) is taking me to an elementary school nestled in the Great Smoky Mountains, in one of the poorest counties in the United States. To be clear, this community is poor in resources, but certainly not in spirit. As we pull into the parking lot, we see a “Welcome Save the Children” message on the school’s billboard. The lot is already full of cars, and little ones are tugging at the hands of their grown-ups to get through the doors. It’s now dark, and Thursday. Oh to have that much enthusiasm at the end of the week! We stroll in behind them, our arms loaded down with boxes of books donated from Scholastic, who partners with U.S. Programs to get more books into the hands of the children we serve. The closer we get to the library, the louder the conversational hum gets. I thought this was going to be a small family night for first graders. Children performing at the Readers’ Theater at their sponsorship supported school in Tennessee. We are greeted by a woman wearing a Save the Children shirt. She presents an air of leadership, so I assume she is the Principal. “Welcome to our school! We are so glad y’uns could make it out. The kids are so excited to do their Readers’ Theater. Everybody’s here,” she smiled and added with a Southern twang. The library is packed. Parents, grandparents, babies, children convincingly dressed as animals, other non-animal children… We found a corner of the room, and the woman who greeted us turned her attention to addressing the crowd. She introduces the Save the Children visitors, and proceeds to enthusiastically share the school’s sponsorship program plan with the community. 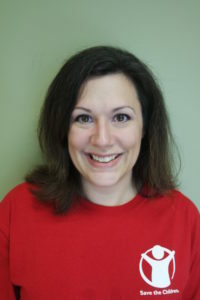 She remembers to introduce herself, “Oh, and I’m Belinda, the Sponsorship Community Liaison.” She’s not the Principal, but an extremely motivated and proud community member who works with sponsorship. I’m floored. And thrilled! This was the first Literacy Family Engagement night for the school, paid for by Save the Children sponsorship, of many more planned for the rest of the year. This school joined us as a new partner, trying out this new program seeking to reach more children, and empower more communities to come together to help kids be successful at school. This night was the culmination of months of planning between the school, parents, members of the community and Save the Children. For me, it felt like the culmination of four years of my life as the Director of Sponsorship in the United States. Seeing this program play out before my very eyes was more gratifying than I can explain. But I’ll try. 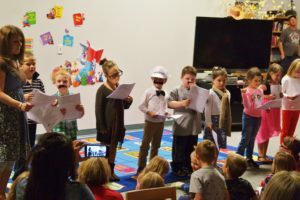 Children performing at the Readers’ Theater. You see, we’ve always been a little different here in the U.S. Poverty looks very dissimilar internationally, and the needs of children overseas are certainly more obvious at a glance. This is not the case in rural America. Addressing the impact poverty makes on children here is not always providing basic needs, installing running water, or building a school. Here, it’s more subtle. The road out of poverty is more winding and curved, but after what I’ve seen tonight, I think we’ve found some capable navigators. 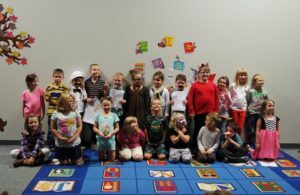 Right there they stood, packed into a library wearing tails, whiskers and duck feet, reading aloud to their families and community while acting out the story. These first graders will be navigating their way right out of the hills of have-not, around the twists and turns of grade-level reading, and upward to the peaks of their own success. In the U.S. a child’s chances of breaking the cycle of poverty are only as good as the quality of their education. Similar to my car-sick journey to the school, the road out of poverty is long and daunting when you’re not equipped with the things you need for the journey. But these kids have something special – this community, and more than 21,000 sponsors in the U.S. providing support along the way. Thanks to sponsors, these students have new books to read and activities like the Readers’ Theater to participate in, getting both kids and parents excited about education and the future. Despite the darkness peaking behind those smoky mountains, the future is looking really bright for kids in this small, rural town.